Woo hoo!! I am here with a blog ribbon award passed to me by our own fellow blogger R.Punitha from “http://southindiafoodrecipes.blogspot.com/” ….She got a wonderful space to visit. It’s a place where you’ll find awesome South Indian delicacies from her kitchen. Thank you so much for passing it to me and making me feel so happy.. Loved the award. 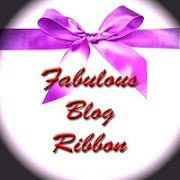 By the way the blog ribbon has few rules to follow.. And here it is..
Rule 5 : Pass this ribbon to ‘5 lovely blogger friends’ (leave a comment in their blog to notify that you’ve passed them this ribbon). Being with my mom, dad, bro & family. When I was selected in campus interview. When I decided to marry my very best friend.. The very first trip to China..
Hope you guys accept this award..